Give this a look and, if you wish, a try. Make changes, create alternatives, have fun! 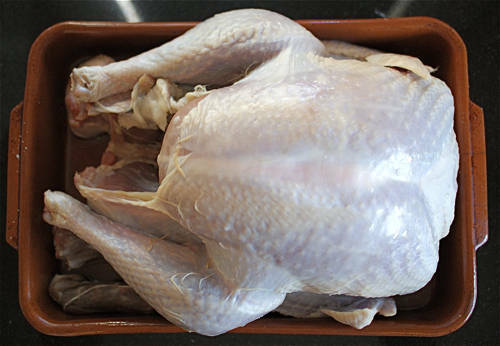 Take the turkey out of the bag that it came in from the store and rinse well inside and out in cold water in the sink. Locate the bag of ‘extra parts’ inside the turkey. These are called the ‘giblets’, and you’ll need to check ‘both ends’ as packagers sometimes hide the neck inside the “other end.” Set all of these pieces aside for the dressing if you’ll be using the recipe below. Otherwise, ’86’ (throw away) the giblets. Pat the turkey dry with paper towels, inside and out. When the turkey is fairly dry, rub the whole bird with olive oil. Wash your hands and then sprinkle the turkey generously with salt, pepper, and herbes de Provence. You can also cut a lemon in half and drizzle the bird with the juice of one lemon. Put the spent lemon halves inside the bird. Rough-cut/chop an apple, an onion and three stalks celery and place the pieces inside the turkey along with the lemon. Put 1 Tablespoon flour into the plastic Reynolds Oven Bag. Close off the bag with your hand and shake well to coat inside of the bag with the flour. Place turkey inside the Reynold’s Oven Bag. Seal with the provided twisty tie and roll the bird around to coat with flour. Then place ‘bagged’ turkey in a roasting pan. Cut three 1 to 2 inch slits in the top of the bag for venting. You’ve got about 30 minutes before you need to report to the Green Bean Casserole Station. So use this time to set the table. Dinner plate in the center. Fork to the left. Knife and spoon to the right. Napkin under the fork on the left. Make it nice; take your time and go slow. You can eat fast at any other time during the year. 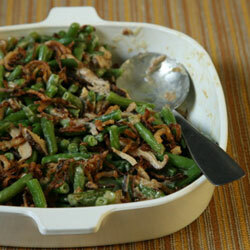 When you’ve got the table just the way you like it, check out this history of the Green Bean Casserole from Saveur.com. Green bean casserole—that perennial Thanksgiving side dish of French-cut green beans baked in a mushroom–cream sauce and topped with crisp fried onions—was such a tried-and-true favorite at my family’s holiday table when I was growing up that I hardly paid any attention to it. Only recently did I uncover its colorful history. Like most American casseroles, this one can trace its roots to the Depression era, which gave rise to a number of one-dish meals that made the best of readily available and inexpensive ingredients. By the end of the Second World War, numerous forerunners of today’s classic green bean casserole could be found. A 1947 New York Times article included a recipe for a version made with sliced frankfurters. Another recipe, published in the Los Angeles Times three years later, called for a mixture of green beans, hamburger, condensed tomato soup, and a biscuit topping. The dinner that Brownstone had attended took place at the home of John Snively, a wealthy citrus rancher in Florida, and his wife, May. The conceit of the event was that the Snivelys had served a replica of the evening’s menu to Iranian royalty: Shah Mohammed Reza Pahlevi and his wife, Queen Soraya, who had recently paid a visit to the ranch. Mrs. Snively had presented a memorable meal of brunswick stew and a delicious green bean casserole made with cream sauce and mushrooms. The queen, Mrs. Snively told the assembled members of the press, had apparently loved the casserole and “had eaten [it] with gusto”. With that, Brownstone had her story and, thanks to some help from the Campbell’s Soup test kitchens, her featured dish. The article she wrote was headlined “Beans Fit for an Iranian Queen”, and the recipe that ran with it was dubbed “Beans and Stuff”, which is how the Snivelys’ less than silver-tongued butler had allegedly announced the dish. Put turkey in the preheated 350 degree oven. Keep this in mind: when the turkey is done, (allegedly between 12:30 and 1:00 P.M. — watch for pop-up thermometer if your turkey has one), being careful of the steam, cut the bag open and let the turkey just ‘rest’ and ‘set’ for about 30 minutes before carving. 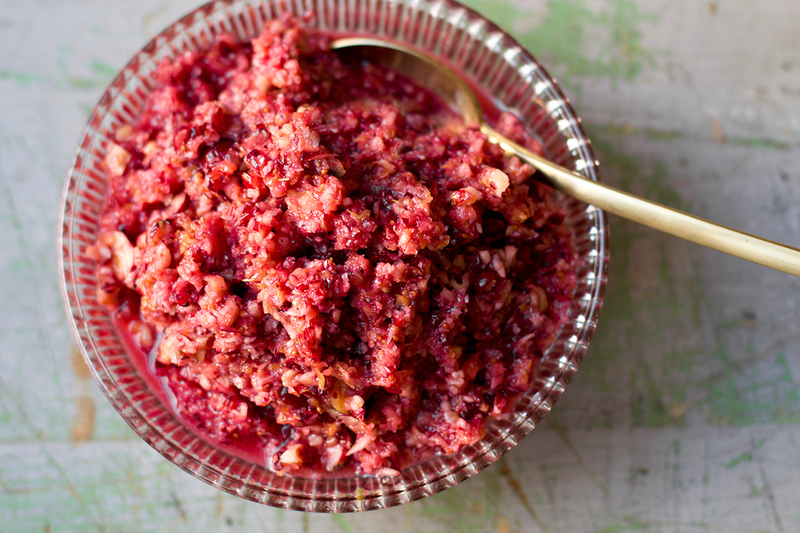 Combine cranberries, orange juice, sugar, lemon juice, cinnamon, salt, pepper, and both zests in a food processor; pulse until berries break down. Transfer to a serving bowl; stir in apples. Chill until ready to serve. Here we go… first, wash your hands. If you are using frozen French Cut Green Beans, take them out of the freezer to thaw (there is no such word as “unthaw”). If you’re using fresh green bean, take them out of the bag and rinse under cold water. In a bowl, mix the following together and pour into the glass baking dish. Set this aside for baking later. Put into a greased 2 quart casserole (glass baking) dish. Pour topping evenly over the casserole. 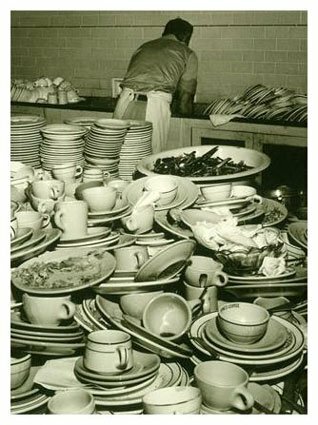 Remember to wash your dishes as you go so you don’t have a mound of dirty dishes staring at you when you’re eating and no one wants to do dishes at the end. Note: There is a difference between stuffing and dressing. Simply put, stuffing is actually ‘stuffed’ into the bird prior to its completion. Dressing, on the other hand is served as a side dish. Its ‘dresses’ up the table, whereas the stuffing stuffs the bird before it stuffs you. And me. Add the giblets to 1 quart (4 cups) water with sage and salt. Bring this broth to a boil, then back the heat off, simmering for about 45 minutes. Meanwhile, in a sauté pan, brown the sausage, breaking up the meat as you go, 5-7 minutes. Add the onion and celery and continue to cook over low heat until the vegetables are tender, another 5-7 minutes. When the giblets have been cooked, remove the giblets from the broth and set them aside to cool and reserve the broth. 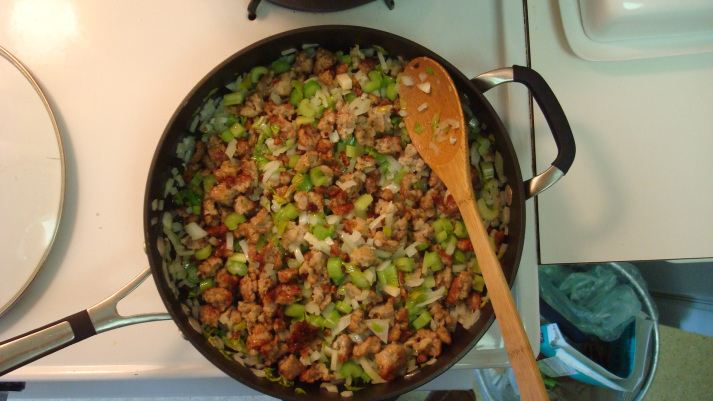 Pull the meat from the neck, finely chop the other giblets and add all of this to the sausage, onions and celery. Cook for 5 minutes, then transfer to a larger bowl. Open the bag of seasoned stuffing/dressing bread cubes and toss to mix completely. Add the reserved broth and again, toss until the broth is well incorporated. Transfer this to a baking dish to be baked at 350 for 45 minutes. Separate and peel garlic cloves. In a large Dutch oven or kettle, arrange potatoes and garlic cloves. Cover with water; add 1 tsp. salt. Bring to a boil, covered, over high heat, reduce heat. Simmer until tender when pierced with a fork (25-30 minutes). In a small saucepan, warm milk and butter over low heat. Drain potatoes and garlic; add warm milk and butter, cheese, 1 tsp salt and pepper. Mash with a hand potato masher and smooth. Put Green Bean Casserole, the Sweet Potato Casserole and the Thanksgiving Dressing in the oven Bake at 350 degrees for 45 minutes. The turkey should be getting close to being done … watch for the pop-up thermometer. When the turkey is done, carefully take it our of the oven and even more carefully open the cooking bag and let the turkey rest. With a baster or a ladle, carefully remove the juices from the bottom of the bag and reserve for the gravy. Melt the butter in a large sauté pan over medium heat until foaming. Add the shallots, season with salt and pepper, and cook, stirring occasionally, until browned, about 15 minutes. Add the flour and whisk constantly until the flour is no longer raw-tasting, about 1 minute. Increase the heat to medium high, add the white wine, scrape up any browned bits from the bottom of the pan, and cook until the mixture thickens, about 1 minute. Whisk in the stock or broth and cream and bring to a simmer. Reduce the heat to medium and simmer, stirring occasionally, until slightly reduced and thick enough to coat the back of a spoon, about 10 minutes. Strain through a fine-mesh strainer into a small saucepan or serving dish, taste, and season with salt and pepper as needed. Wash and dry any dirty utensils, etc. Top Green Bean Casserole with the remaining 2/3 cup french fried onions. Put back into the oven and bake 5 minutes longer. Leave the amount of rolls you want on the oven proof tray. For a softer crust, warm in the oven for 2-3 minutes. For a crisper crust, warm in the oven for 4-5 minutes. Fill glasses with ice and the Martinelli’s. 1:00 p.m. … Dinner is served. Give thanks for the phenomenal year just past, where you are today and where you are going. Give thanks for your family who loves you and believes in you and your God-gifted/given potential. Eat all of the other stuff. 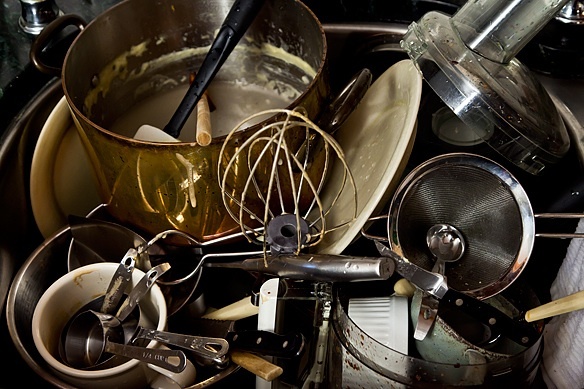 Clean up the kitchen; always leave it neater than you found it. God our Creator, out of the seed you grow a tree: out of nothing you bring this meal. We honor your power, we praise your might. Create in us a new spirit, that we may bear fruit for others and so share our life with the world. Through Jesus Christ, Amen. God of all hopefulness, God of all joy, Whose trust, ever childlike, no care could destroy; Be there at our waking, and give us, we pray, Your love in our hearts, God, at the break of the day. God of all eagerness, God of all faith, Whose strong hands were skilled at the plane and the lathe; Be there at our labors, and give us, we pray, Your strength in our hearts, God, at the noon of the day. God of all kindliness, God of all grace, Your hands swift to welcome, your arms to embrace; Be there at our homing, and give us, we pray, Your love in our hearts, God, at the eve of the day. The eyes of all wait upon you, O God. You give us our food in due season. You open your hand and satisfy the desire of every living thing. Amen. Dear God, Bless this food which you have given. Cause it to nourish our bodies, That we may be able to serve you and your world. Amen. O gracious God, when you open your hand, you satisfy the desires of every living thing. Bless the land and waters; give the world a plentiful harvest; Let your spirit go forth to renew the face of the earth. As you show your love and kindness in the bounty of the land and sea, save us from selfish use of your gifts, so that women and men everywhere may give you thanks, for Jesus’ sake. Amen. People: And remember the hungry. People: And remember the sick. People: And remember the friendless. People: And remember the enslaved. All: May these remembrances bring happiness. We swim in your grace like a whale in the ocean. Here at the table, God, we bow to receive the food that you bestow, all to your honor, and for our good; now bless in Jesus’ name this food. Amen. O God, Giver of all Good Gifts, we are grateful as we pause before this meal. May your presence be the “extra” taste to this food which we eat in the name of Jesus the Christ. Amen. As this food is about to serve us as nourishment, may we also serve one another. May the seal of God’s love rest upon this food, and upon this day. May we and our gifts of food be under the tent of God’s peace. Amen. 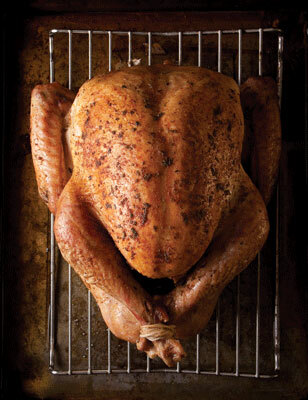 Question: When roasting a turkey does it matter what type of roasting pan that you use? Is stainless steel better than nonstick? Answer: A large substantial roasting pan is what you need for roasting turkey. You will get better drippings with a regular, not non stick, pan which makes a better base for a gravy. Question: My family is really big on stuffing, the problem is there just never seems to be enough. How can I get that same great taste with stuffing cooked on top of the stove or baked out of the bird? — Jenny Campo, Oakland, Calif.
Answer: The stuffing can be baked while the turkey is resting. Put the stuffing into a baking pan and moisten it with a little chicken stock. Cover with foil and bake at 325 degrees F. for 30 minutes. If you want it to develop a little crust on top, remove the foil for the last 15 minutes. The stock keeps the stuffing moist, like it was inside the bird. Question: What is the cooking time per pound assuming cooking at 325 degrees F.? Or is 350 degrees better? — Gary Krulewitz Lake Worth, Fla.
Answer: I wouldn’t go by minutes per pound because there are too many variables. I would use the following chart as a guideline and check the turkey at the early end of it; 325 is my preferred temperature for cooking the bird. — Bari Edwards, Sherman Oaks, Calif.
Answer: The thermometer goes into the thickest part of the thigh and should not touch the bone. Question: I only have one oven, how do I cook the turkey, rolls, ham and vegetables and get them all done at the same time? Answer: The turkey should rest for at least 30 minutes and will stay very hot for up to 1 hour. You can use that window of opportunity to heat up all the other elements of the meal. Question: How do you always get the turkey out of the pan so it doesn’t fall apart? — Megan Guynn, Sullivan, Ill.
Answer: It helps if you cook the turkey on a rack but even if you don’t, the easiest way to get the turkey out of the pan is to insert large carving fork or the handle of a wooden spoon into the cavity and stick another fork in the other end of the turkey to gently lift it out. Question: What is the best way to carve turkey? — Ron Grace Drexel Hill, Pa.
Answer: First remove the wishbone. Then cut off the wings and remove the leg thigh joint, separate the leg from the thigh and then slice the thigh, leaving the leg whole for someone to chew on. With the turkey breast side up, make a horizontal cut at the bottom of one side of the breast from front to back. Then start carving thin slices off the breast of the bird starting at the breast bone and working downward. You can also remove the whole breast half and then slice it off the bone. Q: How do you wash a turkey? A: Put the turkey in the sink and remove it from the wrapper. Take the package out of the cavity and set it aside. Rinse the turkey inside and out with cold running water. Let the excess water drain out of the cavity and pat the turkey dry, inside and out with paper towels. If you are going to use the neck and giblets from the package in the gravy, rinse them as well (discard the liver). When you are all done rinsing the turkey and giblets, clean out the sink with hot soapy water and a little bleach. Q: :How do you defrost a turkey? A: In the refrigerator: Thaw turkey in its unopened package on a platter to catch any defrosting juices that might come out. Allow one day for every four to five pounds of turkey. So, a 15 pound turkey would take three days to defrost. In the sink: Put turkey breast side down, in its unopened package in a sink filled with cold water. Change the water every 30 minutes to keep the temperature cold. Allow 30 minutes for every pound of turkey. So, a 15 pound turkey would take 7 1/2 hours to defrost. Q: How long will turkey keep in the freezer? A: Up to one year, after that it will not harm you provided your freezer is at the tight temperature, it will just not taste as good. Q: How long will a defrosted turkey keep in the fridge before you cook it? A: Two to four days. Q: How long will a fresh turkey keep in the fridge before you cook it? A: Every turkey should have a “use by” date on the label. Make sure you cook the bird by the “use by” date. Q: How big a turkey should you buy? A: Depending on how much you want to have for leftovers, you should plan on 1 to 1 ½ pounds per person. Q: How much stuffing should you make? A: About one cup per person. Q: How much gravy should you make? A: At least 1/2 cup per person. Q: What about brining a turkey? A: Brining turkey is the best way we know to guarantee moist, tender meat. The basic point into soak the bird in a mixture of salt and water; the electrically charged ions of the salt plump up the muscle fibers, allowing them to absorb water. This changes the structure of the proteins, preventing the water from escaping during cooking. In addition to keeping the meat moist, the salt intensifies the flavor. For a basic brine, stir together 8 quarts water and 2 cups kosher salt in a clean 5-gallon bucket or container with a cover. If you like, you can add a bit of sugar to the brine, along with whatever spices strike your fancy. Add the raw turkey, cover, and chill for 10 hours. If you want to soak the bird for 24 hours, reduce the amount of salt to 1 cup (Excerpted from “The Gourmet Cookbook,” edited by Ruth Reichl, Houghton Mifflin, copyright 2004. Q: How do you make pan gravy? A: Anytime you cook a roast you are going to end up with delicious bits of concentrated meat juices sticking to the bottom of the roasting pan. They are a great base for a sauce. If you want to take advantage of them, transfer your roast to a platter and cover it loosely with foil. Then calculate how much gravy you want to end up with. I generally plan on 1/4 cup to 1/3 cup of sauce per person (more at Thanksgiving, when so many dishes require a gravy topping). 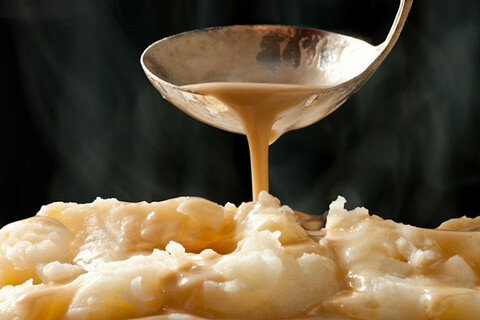 For each cup of medium-consistency sauce you will need 1 cup of broth and 1 to 2 tablespoons each of fat and flour. Pour all the fat from the roasting pan into a bowl. Measure the correct amount and put it back into the pan. Add the flour and cook over low heat, stirring frequently for a few minutes. Meanwhile, heat your broth in a separate pan. Add the broth to the fat/flour mixture in a stream, whisking, and continue whisking until you see no more lumps. Bring the mixture to a boil and simmer if for as many minutes as there are tablespoons of flour in the gravy. (Excerpted from “Sara Moulton Cooks at Home,” by Sara Moulton, Broadway copyright 2004). Have you ever sat through the credits at the end of a movie only to find one last final albeit very brief scene that everyone who got up at about the point where the Key Grip and the Best Boy are credited missed? Don’t you just feel like you won a prize? Well, if you’re still tracking with the Thanksgiving Day festivities, you know that it’s not over ’till the pie is gone. If you’ve waded through all of the data just above and you’ve landed here, this is your lucky moment. Here are two really awesome pie standards. First, of course, is “Libby’s Famous Pumpkin Pie.” After that, the Derby Pie. Try either one. Or both. Mix sugar, cinnamon, salt, ginger and cloves in small bowl. Beat eggs in large bowl. Stir in pumpkin and sugar-spice mixture. Gradually stir in evaporated milk. Pour into pie shell. Bake in preheated 425° F oven for 15 minutes. Reduce temperature to 350° F; bake for 40 to 50 minutes or until knife inserted near center comes out clean. Cool on wire rack for 2 hours. Serve immediately or refrigerate. Top with whipped cream before serving. This recipe makes 2 pies. Preheat the oven to 350 degrees. In a large mixing bow, beat the eggs. Add the sugars, pecans, vanilla, corn syrup, melted butter, chocolate chips, and the flour. Pour into the two pie shells. Bake at 350 degrees for 45 – 50 minutes until set. Serve with ice cream. Subscribe to comments with RSS	or TrackBack to 'Thanksgiving: Start To Finish Beginning to End…(Pretty Much…)'. I would order the pie in. I would suggest a pecan and a Virginia peanut pie from the Jamestown Pie Co. of Jamestown, VA. Their phone # is 757-229-0819. They also have a website http://www.buyapie.com. Thank you Lord for the gift of sharing. We are making the sweet potato gratin because of it. Blessings to the Gauche Family. 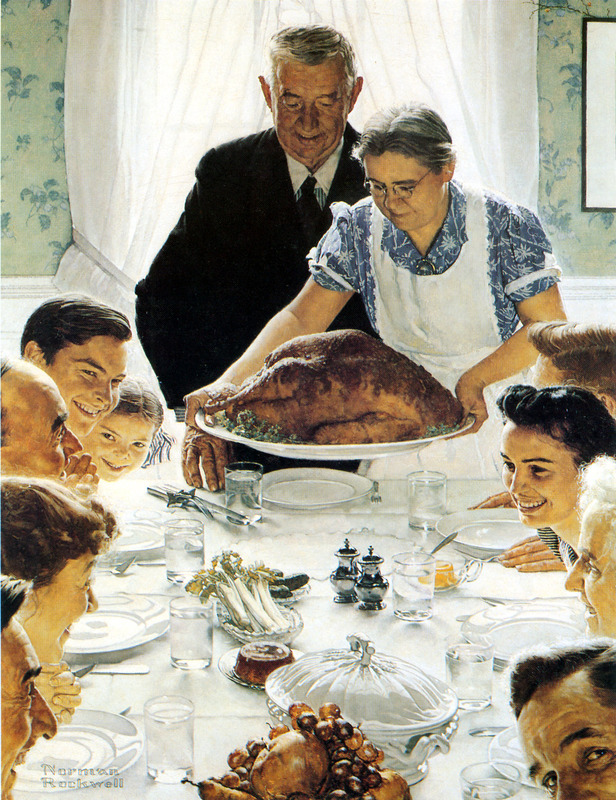 Love this site, and the memories of the Gauche/Valan Thanksgiving feasts. Love to you all! Looking up stuffing recipe……and stove top with chicken broth sounds easy enough……we have been going without. I think it is time to add it back into Thanksgiving! Yes, thanks for coaching and sharing, and making it so doggone much fun!! 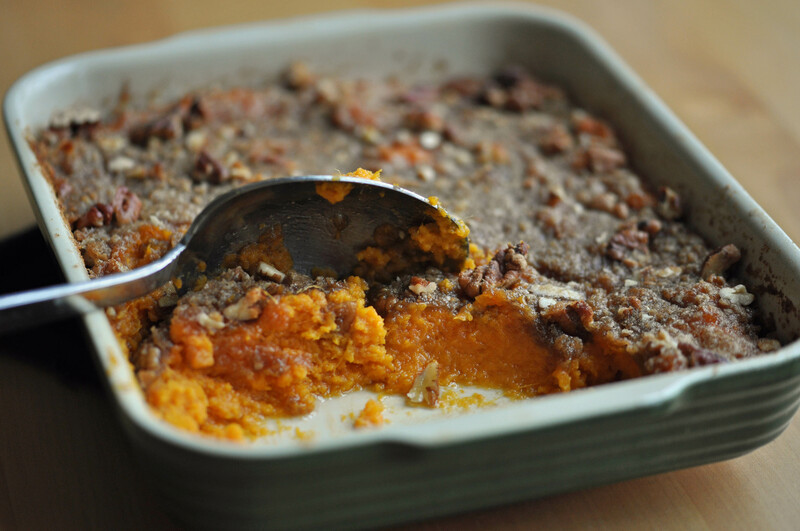 Trying the sweet potato gratin tomorrow! Yummmmmm. Thankful for the gift of friendship and the mutual love for good eats! I kindly gave the pie baking job ( I always make the pies) to another member of the family who wanted a change 🙂 in Thanksgiving responsibilities and sooooooo I will be making your green beans! Thanks for the recipe! Wonderful!! Thank you for taking the time to put this all together and for sharing. One of our lifetime blessings … the Gauche Family. Hey Lydia! Thank you for this sweet note! What a joy in my morning! I wrote this whole thing for Soren about 4 years ago when — for some weird reason we were all going in different directions. He wanted to “Do Thanksgiving” so I sat down and cranked this out. So for, it’s been a great help to a ton of people. I’m hearing from people I’ve never met that this is part of their ramp-up to the best day of Thanking! What fun! We’re thankful for you and your family and all our dear friends in Faribault–such great memories we have of our time together! Hurray! Lois, dear Lois! thanks for your kind note! Happy, happy Thanksgiving to you and your dear family!